Go ahead, get your feet wet. If you have an interest in the environment, a love for the ocean, or just a desire to make a difference, Scripps Institution of Oceanography encourages you to get in on the action. You can be a partner in addressing the great environmental challenges of the 21st century. 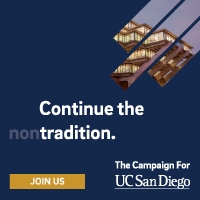 Scripps welcomes you to be a part of the important discoveries being made here by joining one of our membership groups, or simply coming by for a visit. E.W. Scripps Associates (EWSA) is a premier group of annual donors who make a difference in the global research. Members learn about ocean, earth, and climate science first-hand from Scripps scientists at "behind-the-scenes" events and are given special access to Birch Aquarium at Scripps. Birch Aquarium at Scripps, the public exploration center for Scripps Institution of Oceanography, receives no direct state or city support and relies on earned income and gifts to operate our exhibit and education programs. Private support is crucial for maintaining the integrity and accessibility of the Scripps Oceanographic Collections. The Scripps Director's Circle includes individuals, foundations, corporations, and other organizations that have made donations or commitments to Scripps totaling $100,000 or more. The Scripps Oceanography Director’s Council consists of a select group of advisors who work toward expanding awareness and support of Scripps’ research, education, and outreach programs.